First, what exactly is a ‘parquet deformation’, and what is its relation to tessellation? At first glance it has no obvious reference or connection to tessellation matters, with the obvious thought of it referring to flooring per se. Indeed, the term and concept may be wholly unfamiliar to most people, even with an interest of tessellations, which I shortly detail. Such an aspect of tessellation has received relatively scant coverage, and in my opinion disproportionately so as to its inherent worth; the effect is most gratifying. 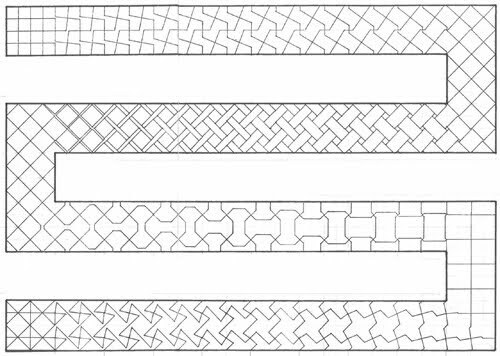 Therefore, to clarify such matters, I now define a parquet deformation as a ‘geometrical tessellating metamorphosis’, usually shown as a ‘long strip’ of a horizontal presentation (although other formats are possible), of which the tiling changes, subtly so at each alternate stage, almost inconsequentially so, but drastically so when seen from beginning to end; the beginning and end tiles bearing no relation to each other. As such, in contrast to any ‘orthodox' picture, for example a portrait or landscape, or indeed a tessellation in the ‘normal’ sense, with the eye wandering ‘at whim’, a parquet deformation is not intended to be viewed in a generalised sense, but is instead intended to be read in a specific way. For the commonly to be seen strip, as detailed above, this is then ‘scanned' by the eye, in a left to right or vice versa direction, as in reading a line of text. Whereupon having so done, a given tiling thus can be seen to gradually metamorphosis in outline, until upon ‘completion' of its metamorphosis it is unrecognisable from its beginning. Concerning the history and background to parquet deformation, only in relatively recent years has such an idea come to the fore. Indeed, despite tessellations per se having been of interest for centuries, such an apparently simple metamorphic concept was apparently not thought of. As such, to all intents and purposes, the originator, and the describer of the term is William S. Huff, a Professor of Architecture at the State University of New York (SUNY) with examples dating back to the 1960s. Although earlier, isolated examples do indeed occur, such as in parts of M. C. Escher's Metamorphosis, and also some isolated examples ‘of sorts' in the book Pattern Design by Lewis Day, these cannot be considered in any way equal to Huff's more thorough and systematic work in this field, albeit he himself does not compose these in the normal sense of the word. Indeed, Huff has, in his role as Professor of Architecture at the State University of New York (SUNY) not only brought the concept of such a thing to the fore but has also inspired numerous students of his to compose many new examples, many of notable skill and ingenuity. Such studies eventually led to the first popular account, with the publication (1983) of his students’ work in the Scientific American article ‘Parquet Deformations: Patterns of Tiles That Shift Gradually in One Dimension' by Douglas Hofstadter. Further examples by Huff's students are to be seen in Intersight One 1990, although this is rather an obscure publication. Of note is that all these predate the age of the computer; all the examples above are drawn by hand. Subsequently, the computer has been used in the undertaking, of which this offers up new possibilities that are impractical by hand. However, despite these initial, promising beginnings, subsequent interest has been lukewarm, to say the least, with no books or papers appearing, at least to my knowledge. Indeed, it can be said the subject went into a slumber, and has only relatively recently been revived, at least in published form, with new examples in 1998, comparable in quality to the students of Huff's, most notably with examples by Craig S. Kaplan and John Sharp, details of which appear on the links page. Some other names to look out for are Andrew Cooke, Daniel Piker and Norman Courtney. Also, see Scott Kim pp. 14-15 for an uncredited instance. An interesting observation as to design matters is that of the connection with the field of architecture rather than that of the perhaps more obvious one of mathematics and specifically tessellation. Indeed, the architecture connection is evident from the very beginning, with the founder, William Huff. Subsequent to his work, there have also been other architects with an interest, such as Tuğrul Yazar, Werner Van Hoeydonck and Gunter Henn. Perhaps somewhat surprisingly, despite an obvious link to tessellation, there are relatively few mathematically inclined people with an interest. Instead, mathematicians seem to take a (generally) brief interest as a result of their studies in general. Craig Kaplan is perhaps the obvious exception. An open question, therefore, is what makes this topic of interest to architects? The disciplines seem somewhat disparate, at least at first glance. As alluded to above, different formats are indeed possible, and not just the ‘usual’ portrayal of the long strip. Indeed, the only limit is one’s imagination. Frequently seen are square blocks, and for the sake of variety, I show a long strip; albeit this wasn’t thought through at the time; it is lacking in aesthetics. I also show a rectangular loop, of which in principle this is merely four parquet deformations butted together and then bent to form the loop. Furthermore, one is not necessarily confined to a square based; equilateral triangles can also be used. What I term as aesthetics is a most important part of parquet deformations, in that this determines the quality. This is a vital aspect of parquet deformations and is too often neglected. As alluded to above, since Huff’s day, the computer has in effect stormed the world of design and is being used more and more, to the exclusion of hand drawings. Indeed, with the advent of this tool, it opens up new possibilities that simply are impractical by hand; different formats, more complex examples. it also has the potential of time-saving; drawing by hand can indeed be laborious Be that as it may, what still counts is the inherent quality or aesthetics of the design. What makes for a ‘good’, or indeed ‘bad’ parquet deformation? As a basic statement, those by Huff’s students serve as this model; they possess a degree of ‘elegance’ that others in this field do not possess. And I might add that mine do too, but differently subtly from Huffs. Huff’s instances can be broadly divided into two types (a) those that evolve into simple geometric tiles: e.g. Crossover, Dizzy Bee, Consternation, and (b) those that more involved final tile, such as Crazy Cogs, Arabesque, Curracha. In contrast, mine are all ‘simple’ geometrical tiles, such as a right-angled triangle to a rectangle (No. 1). Another important aspect is the tempo. By this, I mean that the changing of the tiles should be neither too ‘quick’ nor ‘slow. A quick example would be where the change is too drastic, of just a cycle of say, two or three stages. Here, the change would be too quick for the eye to view. Slow would say, one hundred, where change is imperceptible at each stage, and so would make for tedious viewing. A feature of this way of designing is that the finished deformation is not predictable, resulting in a pleasing surprise upon completion. As a rule, I favour a simple beginning, typically of a square, as this acts as a fundamental aspect, in contrast to an arbitrary geometrical shape. A different type of approach is to begin and end a deformation with a certain polygon or geometrical shape in mind. Some examples of this include the Laves tilings, where Craig Kaplan  show this. Note that mostly in contrast to the Huff examples, mine can in a sense be continued; for example, No.4 can be butted on to No.1, which can, in turn, be butted with No.5, and so on. Mine are broadly of a self-contained nature, with a beginning, middle and end, where typically they begin quietly, ‘came to life’ in the middle, before fading towards the end. In essence, each of these is a one-off, albeit as alluded to above, can indeed be joined if so desired. In contrast, Craig Kaplan’s are more of an ‘all-encompassing’ approach. For instance, he set himself the challenge of combining all suitable Laves tilings as parquet deformations and met with success. However, despite the above ‘revival', such as it is, somewhat disappointingly I still find so few people undertaking new examples or who are at least interested in this aspect of tessellation, and so I would be more than interested in hearing from fellow enthusiasts on this matter, especially from the ex-students of Huff's. Of especial interest would be to make contact with the designers of the parquet deformations in the Scientific American article. Where are you: Fred Watts (Fylfot Flipflop), Richard Lane (Crossover), Richard Mesnik (Dizzy Bee), Scott Grady (Consternation), Francis O’Donnell (Oddity out of Old Oriental Ornament), Leonard Chan (Y Knot), Arne Larson (Crazy Cogs), Glen Paris (Trifoliate), Joel Napach (Arabesque), unknown (Razor Blades), Jorge Guttierrez, (Curacha), Laird Pylkas (Beecombing Blossoms), Vincent Marlowe (Clearing the Thicket). And latterly in Intersight One; Jacqueline Damino (Right Right Left Right), Rodney Wadkins (In Two Movements) Darren Moritz (Enlarging on Four Points), Alexander Gelenscer (Hex-baton), Maurizio Sabini (Venetian Net), Robert Johnson (untitled). Did you do any others or simply left these behind upon completion of your student days? I would love to hear from you! Or indeed, from anyone who knows these people. The reference by Francis O’Donnell to ‘Oddity out of Old Oriental Ornament’, allude to a tiling (or more accurately lattice design) that can be seen in Chinese Lattice Designs. 1200 Designs by Daniel Sheets Dye. p. 420, example b. Some of my own examples are shown below. Below is a compilation, in chronological order, from other people’s parquet deformations. Do any readers have examples of their own suitable for inclusion? If so, do send them to me! Although not strictly necessary, some background detail as to the creation would add to the story. As discussed above, parquet deformations are usually shown simply, in one-dimension. However, it is indeed possible to have two dimensions. Indeed, this perhaps next stage in development was realised early on, at the time of Huff’s student-inspired creations, in the early 1960s. Quite who first thought of the concept is unclear. Did Huff suggest this? Was it a student-led initiative? Whatever, at least two of his students, David Oleson and Roland Findlay, show such instances, with Oleson’s I at the Center, dated 1964, with Findlay’s non-titled work not dated. Oleson’s work is the more widely known, discussed in depth and appearing in Douglas Hofstadter, whilst Findlay less so, only of a local newspaper article, and so here I thus concentrate on Oleson as the founder, rightly or wrongly in terms of priority. At the centre of his deformation is the capital letter I, from which the deformation in effect starts, and of which seen at the extremities of the square format the underlying shape remains. Such two-dimensional concept can be said to have ‘added value’, although this is not to denigrate the one dimension type; all are of merit. Indeed, the variation, or novelty, call it what you will, appears to have attracted the attention of others, with at least three discussions on Oleson’s work. Douglas Hofstadter, Tuğrul Yazar and Richard Plender have all written on Oleson’s work in relative depth, all seeing some additional meaning to this. Indeed, Hofstadter describes this instance as a favourite of his. Oleson later went on to become a well-known architect. He is the only ex-student of Huff whose contact detail I have been able to find, but disappointingly did not respond to an email as to further details of his design. John Sharp, of the UK, a prominent mathematician, with an leaning towards geometry and mathematical art, has, in a series of four blog postings (from 2010, see links below), shown both his own parquet deformations (of which he uses the alternative term ‘morphing’), numbered 1-12, as well as having a tutorial intent. These are all of the classic Huff-type, without any degree of complexity as evinced by Craig Kaplan’s more advanced work, but as discussed above, this is an observation rather than a criticism. 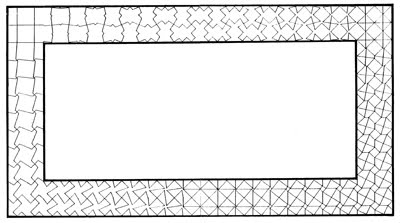 A further page discusses deformations with an Islamic theme as a subpart of an Islamic tiling discussion. Of the numbered instances, both one- and two-dimension types are shown. Perhaps the best, of a two-dimension type, is that of No. 4, which has undoubted elegance. Further, the download page is a good source for ideas. The City of Kent lies in the middle of the Green River valley, which is reported to be the richest farmland in the state of Washington. Before World War II it was primarily occupied by small Japanese-American truck farms that sold their produce in the Seattle Public Market and now is mostly filled up with large retail buildings and warehouses. The installation is meant to be a reference to that history as well as a place of beauty and elegance in the midst of the busy goings on of the city administrative offices. Further, Courtney was married to a Japanese woman and loved things Japanese. The notion of combining the folding screen with the parquet deformation idea came from that influence. And the name, of course. Both men, particularly Smith, have distinguished artistic backgrounds. Smith is well known as an early pioneer in computer graphics, and is a household name in the field, with too many honours to mention. Courtney was a leading light in the Seattle glass scene. Upon latterly (2018) following this up, Smith told me that he was a long-time fan of tiling, reading Grunbaum and Shephard’s classic book Tilings and Patterns. He wrote his PhD dissertation on CA (cellular automata theory) and became fascinated with tilings as a spin-off from that undertaking. However, possibly this is an adaptation of someone else’s design, as Smith told me didn’t recall inventing one himself. Plausibly, this is from the Hofstadter article. Craig Kaplan (1972- ), a Canadian computer scientist/mathematician, with an interest in mathematical art and computer graphics, can quite simply be described as the leading light in parquet deformation research. In short, he brings his superior mathematical mind to bear on the topic and shows a whole host of innovative and advanced examples that without the aid of the computer would simply otherwise be impractical. Typically, parquet deformations are portrayed in a ‘simple’ manner, as a linear strip. However, although all well and good (and there is nothing ‘wrong’ with this), other geometric configurations are indeed possible, in which the concept is expanded, and so is thus made arguably more interesting. For instance, as shown by Kaplan, building upon the one dimension, two dimensions are possible, with a squared format, in which the deformation is ‘continuous allover’; left/right, top/bottom. Another variation they can be turned into a loop, with a circle. And another innovation is that of an Islamic tiling theme, where, due to the somewhat involved nature of the tiling these are shown possible that simply would otherwise be impractical by traditional hand methods. And again, of a similar involved vein in concept, fractals are also shown. The transitions between the Laves tilings are also investigated, as is a study of the isohedral tilings. In addition, there are also complex computer algorithms developed by others applied here (way beyond the typical recreational mathematical knowledge to compile such ‘simple’ linear instances), such as that by Hans Pedersen and Karan Singh. All of which embodies a most impressive body of work. Further, he has written extensively on the subject with a variety of articles, all of which all can be considered as a must reading (and pleasingly has made these readily accessible). In particular, see his thesis, the articles ‘Metamorphosis in Escher’s Art’, ‘Curve Evolution Schemes for Parquet Deformations’ and The Guardian (all detailed in the references). © Craig Kaplan, with permissions for non-commercial use. Daniel Piker (1982- ) of the UK/US, with a background in architecture, and software user expert, and with a leaning towards geometry and mathematical art, has, in a series of blog postings (from 2009), shows his own parquet deformations (of which he uses the term ‘morphing tessellation fields’). Tuğrul Yazar, an architecture professor of Istanbul Bilgi University, Istanbul, Turkey, can be described as one of the leading lights in the field of parquet deformation research, albeit perhaps not quite in the league of Craig Kaplan’s more advanced algorithm concepts. But even so, he still brings to bear some advanced concepts on the design process. He has written extensively on the subject, online, on his ‘designcoding’ pages and in print. As such, he shares some similarities with William Huff, in that he sets his students design problems with parquet deformations (among other design matters). Links to a variety of pages, including the students' work, can be seen in the references. His favoured computer aid is Rhino and the plug-in Grasshopper (of which I know nothing about). Some of his instances can be seen to be based on my more simple instances, or at least act as a starting point. He also includes discussions on three of Huff’s student-inspired works, Crossover, Trifoliate and I at the Center. Werner Van Hoeydonck (1969- ), an architecture professor of Vienna University of Technology, Austria (and with his own practice) with a recent interest in parquet deformation (2016), has compiled three instances, of the linear type, as well as writing on the topic (see references, with links). As such, he shares some similarities with William Huff, in that he sets his students design problems with parquet deformations (among other design matters). His favoured computer aid is Rhino and the plug-in Grasshopper (of which I know nothing about). These are very pleasing indeed in an aesthetic sense, and one can easily see from his writings and examples that he understands the concept. Edmund Harriss, a mathematics professor with an interest in mathematical art, has shown an interest in the subject, albeit not to an all-encompassing degree as with other people here. Perhaps not unsurprisingly, his work in the field is of a more advanced nature, reflecting his interest in non-periodic tilings, of which he is an authority. Examples of his work can be seen at four elevator surrounds in Champions Hall at the University of Arkansas, USA, newly installed in 2017. This is created from four different non-periodic tilings, one in each corner, that morph into each other from left to right and from top to bottom, thus giving a two-dimensional deformation (although the concept is not new; see Oleson). These are based upon the Amman-Beeker, 10-fold Penrose tiling, 12-fold Socolar tiling and 14-fold substitution tiling. This is all admirably described and illustrated by Harriss in the video from his presentation at the 'Gathering 4 Gardner' (G4G), 2016. Also see the book with Alex Bellos (detailed in references) Snowflake Seashell Star where a single deformation of the above is shown, with likely Bellos title ‘De-four-mation’. Mamoun Sakkal, a Syrian artist and calligrapher, based in the US, has created a most interesting parquet deformation, albeit by ‘favoured chance’, as upon correspondence (July 2018) he was unaware of the premise! Rather, this was composed because of his interest in Islamic geometrical patterns, of which in an article , specifically on overlapping squares, p. 87, he briefly, in the course of his studies, inadvertently created a parquet deformation. This can be seen as both a wireframe, top, and a derivative, below. His instance is aesthetically most pleasing indeed, as upon viewing from left to right, beginning with a series of squares at 45°, the deformation passes through its life cycle, before ending the same as the start. This can be described as having a ‘natural’ life cycle, rather than a simple reverse unwinding mid point, which would have less merit. Sakkal, Mamoun. ‘Intersecting squares: applied geometry in the architecture of Timurid Samarkind’. Journal of Mathematics and the Arts, 2018, Vol 12, Nos. 2-3, pp. 65-95. First, note that although the listing below is believed to be the best bibliography available, this is by no means exhaustive. Many of the references I have found concerning parquet deformation are somewhat obscure and of limited interest and value. In short, to list ‘everything’ would result in confusion rather than clarity; given that some references are of a single sentence, and of no particular significance. Note that I do not have all of the books listed in possession (judged not worth pursuing, with time constraints, and the effort/cost involved in obtaining). A useful reference was Google Books, which I shorten to GB below and can be found on Google. The more important, regarded as essential reading on the subject, is signified by the author’s name in bold. Other books/articles are also ‘highly desirable’, and indeed, there is no firm dividing line at times between the references. Are there other references of note? Is so, do let me know. The listing below is separated into two parts; (i) print, with books, articles and newspapers and (ii) web. Some people appear in both categories. The listing is to be considered as a work in progress, and so is subject to revision/addition. [*] Anon. No Title. The Buffalo News 23 June 1985. On parquet deformation, Huff. One of only two newspaper references I am aware of. The whole article is not available to me, seen only by chance as a clipping next to a story on dancing that showed up when searching! Shows ‘Fylfot Flipflop’, with a discussion in general sense. Essentially a feature on Craig Kaplan’s work rather than a general discussion on the subject, and all mightily impressive. Of a cross section of his work, in which he brings his full range of mathematical abilities to the premise, leaving lesser mortals far behind: ‘fractal’ tiles, ‘organic labyrinthine curves’, ‘Islamic parquet deformation’, ‘One that goes in two dimensions’, ‘And one that is shaped in a circle’. One Harriss parquet deformation (unpaginated, with likely Bellos title) ‘De-four-mation’, of four non-periodic tilings positioned in a corner, which morph left to right and top and bottom. Beat that! Translated: Regular tilings: With applications in Crystallography, industry, construction, design and art. [*] Crowell, Robert A. (editor). Intersight One. State University of New York at Buffalo 1990. See 10. William S. Huff What is Basic Design? : 76-85 and in particular generic problems of synthetic design Students' work from the Basic Design Studios of William S. Huff 80-85. With works by Jacqueline Damino (Right Right Left Right), Rodney Wadkins (In Two Movements), Darren Moritz (Enlarging on Four Points), Alexander Gelenscer (Hex-baton), Maurizio Sabini (Venetian Net), Robert Johnson (untitled). A most impressive collection, second only to the Hofstadter article, and highly recommended. [*] Day, Lewis, F. Pattern Design. London, B. T. Batsford 1979. First published? I include the reference from Day with a good degree of reservation, as this is weak indeed. Mostly John Sharp inspired parquet deformations. P. 104 Craig Kaplan ‘fractal’. Fred Watts (Fylfot Flipflop), Richard Lane (Crossover), Richard Mesnik (Dizzy Bee), Scott Grady (Consternation), Francis O’Donnell (Oddity out of Old Oriental Ornament), Leonard Chan (Y Knot), Arne Larson (Crazy Cogs), Glen Paris (Trifoliate), Joel Napach (Arabesque), unknown (Razor Blades), Jorge Guttierrez, (Curacha), Laird Pylkas (Beecombing Blossoms), Vincent Marlowe (Clearing the Thicket). And the titles are most amusing too! To pick a favourite is invidious. However, if pressed ‘Fylfot Flipflop’. Of note is that these are all linear. Absolutely delightful! However, Hofstadter seems to have erred somewhat in his commentary; Branko Grunbaum, in Tilings and Patterns, takes him to task, p. 170, correcting his comment on p. 14 ‘Despite the claims to the contrary most of the tilings shown in Hofstadter’s article include tiles which are not prototiles of any monohedral tilings’. This essentially repeats Hofstadter's original July 1983 column in Scientific American (his last), with extra, minor text, but also, more importantly, a ‘post scriptum’, in which a parquet deformation of David Oleson’s ‘I at the Center’ is illustrated and discussed, and much praised. Three parquet deformations, one of which, on page 31, made it into the Scientific American article. See Chapter 4. Minor reference to parquet deformations. Only of interest as to ‘all things’ Huff. Parquet deformation is only mentioned in passing, as a reference. Occasional discussions on parquet deformations (Beecombing Blossoms, p. 198, Fylfot Flipflop p. 194, albeit at a most abstruse level. A discussion on Escher parquet deformations within the context of his prints. Some most impressive, highly advanced parquet deformations. Parquet deformation 190-194, within Chapter 5, ‘Tilings with Polygons’, 5. 10. 5 ‘One-dimensional parquet deformations’, albeit this is mostly merely excepted from Huff’s article (1983), as the author credits. ‘Consternation’ is shown. [*] Kim, Scott. Inversions. W. H. Freeman and Company New York 1989. Parquet deformation, unaccredited, pp. 14-15. Discussion on David Oleson, pp. 108-109. [*] Sakkal, Mamoun. ‘Intersecting squares: applied geometry in the architecture of Timurid Samarkind’. Journal of Mathematics and the Arts, 2018, Vol 12, Nos. 2-3, pp. 65-95. Although nominally of parquet deformation, I have a considerable reservation here; the transitions are far too abrupt. [*] Wintermantel, Ed. ‘Designed To Be Different’. The Pittsburgh Press, Sunday, February 27, 1972, pp. 10-11. One of only two newspaper references on William Huff and parquet deformations I am aware of. Contains a new work and new name not seen before, Roland Findlay (the designer and work are oddly not titled or discussed in the text), and a photo of Huff, the earliest one of him I have seen. Also of significance as the first popular reference to parquet deformations in print form. Uses my design, not that I get any credit! Again, the use of my design without credit. Craig Kaplan talk at Berlin School. A video of the BMS Friday lecture by Craig S. Kaplan (U Waterloo) entitled "Metamorphoses and deformations of tilings". The talk was given on June 06, 2014 at the BMS Loft at Urania. Illustrated with one of my designs without credit, albeit with a link. 30 November 2016. References greatly expanded, replacing the previous six entries with minor commentary text with thirty-two entries, and all with further, extensive commentary and detail.